Strangely for a player trying to find form, Michael Vaughan has played very little cricket over the winter. It may be that his central contract prevented him from playing in a Southern Hemisphere domestic competition, or that he ‘needed some time away from cricket’, but his last First-class match was way back in September, when he made a whopping 14 for Yorkshire against Somerset. In any case (and leaving aside the question of whether the rest has done the trick, or the pitches out in Abu Dhabi are merely flatter than Norfolk), he’s finally back in the runs. The former England captain tonked 115 from 113 balls for his county as they beat Surrey in their opening match of the pre-season Pro ARCH Trophy out in the UAE. There was more good news for the expert proponent of the textbook forward defensive with cartwheeling stump recently, when Duncan Fletcher came out in support of Vaughan returning to the Test side at number three. Whilst this is about as newsworthy as ‘Man drinks Guinness on St. Patrick’s Day‘, I’m sure Vaughan was pleased to see his name appear in a newspaper other than the Yorkshire Post. Adil Rashid had a pretty good day today, making 111 and taking 1-8 from two overs in Yorkshire’s potentially decisive match with Sussex. In fact, he’s likely to finish as the County Championship’s leading all-rounder for this season. With Monty Panesar‘s place in the England side arguably the least secure it has been for some time, and a tour to India (a two-spinner tour if ever there was one) just around the corner, Rashid‘s time seems to be coming. If he isn’t selected in this winter’s touring party, he may never get the opportunity that many feel he deserves. That would be a real shame, both for the young spinner himself, and for England’s lower-middle order. 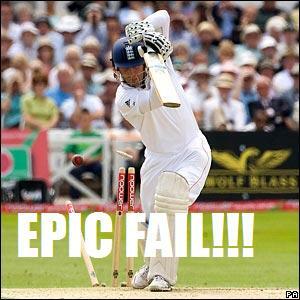 Michael Vaughan faces The Crunch… or does he? I’ve never played cricket for England. I’ve never taken part in a cricket match knowing my future could be on the line. In cricketing terms, you could say I know nothing of The Crunch. Michael Vaughan is about to find out all about The Crunch. He’s about to make it his new home. Because Vaughan, following another failure with the bat during Yorkshire’s game against Somerset at Scarborough, now has a maximum of three innings to make his case for inclusion in England’s winter touring squad. On current form, there is no way he merits a place. Yet the past indulgence he has enjoyed from the selectors, as well as the fact that he was awarded a central contract mere days ago, suggest he might be included anyway. If he is selected, perhaps in place of batsmen who have been making runs all summer, then it will strengthen the case suggesting that an “old boys’ club” mentality continues to exist in the dressing room. Mark Ramprakash has finally done it – making his 100th century for Surrey against Yorkshire. Ramprakash fans may be interested to know that Mark now joins such cricketing luminaries as WG Grace, Donald Bradman and Geoffrey Boycott in the hundred 100s club. Congratulations Ramps, that’s one heck of a monkey off your back. As one young ‘mystery spinner’ got a lot of people (although not everyone) very excited, another one was causing chaos of a type much less welcomed by his team. Some at Yorkshire were able to make a wry joke about Azeem Rafiq’s missing paperwork, but, given that Rafiq was ineligble for the game which he took part in against Nottinghamshire, the whole competition is in a state of confusion. The ECB has convened a panel to decide whether or not a replay will be required. Darren Gough, who struggled to remember the young lad’s name little more than a week ago, probably knows it now.